A media relations campaign focusing on cancer-related research at Duquesne received the Renaissance Award from the Public Relations Society of America, Pittsburgh Chapter. The winning campaign was one of 97 entries in more than 20 categories from public relations offices and firms in the region. 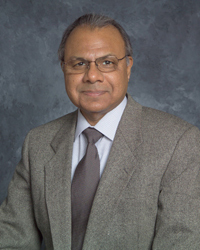 At the awards dinner on Jan. 24, media efforts related to the work of Dr. Aleem Gangjee earned a top award in the budget category of less than $20,000. From September 2011 to March 2012, Gangjee worked simultaneously on five R01 (top research) grants from the National Institutes of Health. International, national, trade and local media across print, broadcast and online platforms featured 295 stories on his work, one of the top media placements for a research story in Duquesne history.